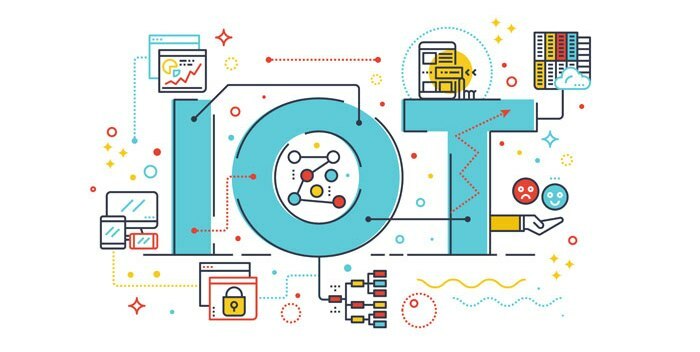 Internet of Things or IoT, as it is widely known, simply put, is a network of devices which can communicate with each other with regards to sending, receiving and analyzing data. These devices may include vehicles, home appliances, smartphones-basically any physical device which is capable of connecting to the internet. Imagine a large spider web which is interconnected and that the devices are small insects caught in the web. Except, in this case, the being-caught-in-the-web is voluntary. Just as the spider web does not discriminate amongst which insects to trap and which to leave, in IoT to anything can be connected to anyone, anywhere. This implies a seamless connection between people and things and/or between things. A more formal definition-IoT is nothing but a network of uniquely identifiable devices or “things” that communicate without human intervention and use the internet to establish a connection. The spurt of growth in IoT and its permeation into almost every field of work has been a fairly recent development. In 2008, the number of things connected to the internet actually exceeded the human population. According to projections, the number of things will be 50 billion by 2020. 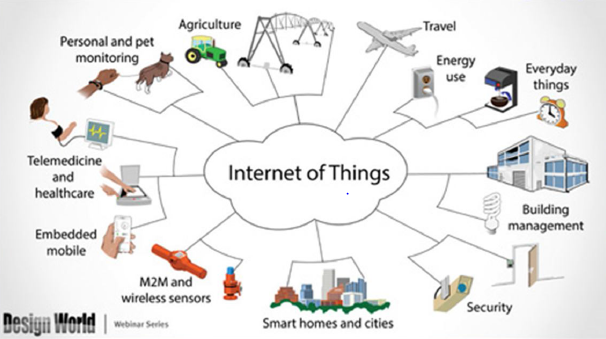 The very basic IoT model would include a “thing” which could be any device/person, a viable internet connection and a connection to the cloud which would ultimately store the data for subsequent analyses. The connections could be of types- People connected to People (P2P), Machines connected to Machines (M2M) or People connected to Machines (P2M). End devices: Include sensors and actuators. 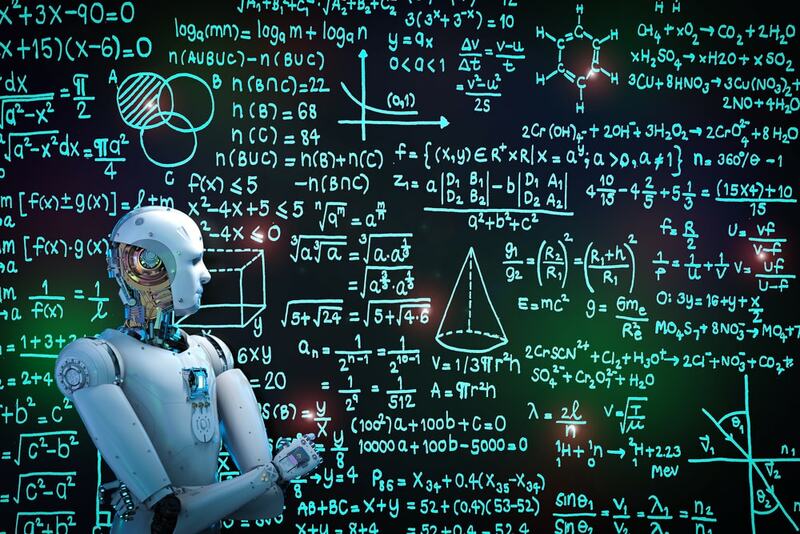 Sensors produce electric data signal from interesting, useful energy, whereas actuators take in the electric data signal and produce interesting, useful energy. In simpler terms, a sensor “senses”, for example, a temperature sensor detects a sudden unusual temperature. Its function is limited to detection and does not include making sense out of it. However, an actuator takes the data into account and actuates the overhead sprinklers in case there is a fire breaking out. Gateways: Devices that collect measurements from all end devices and send commands to the actuators. Taking forward the previous example, the gateway device realizes that a fire is breaking out and hence sends a command to the actuator to turn on the sprinklers and the actuator activates the sprinklers according to the command passed. Gateways close the gap between devices in the field and the Cloud, where data is collected, stored and manipulated by business applications. Networks: The network on which the devices are hosted and connected together. Cloud: Stores and maintains a large amount of data which is constantly changing and is being speedily produced on a regular basis. Application: Through which the human interacts with the devices, like a mobile application to control the lights-switch them on/off, increase or decrease their intensity, etc. Home automation: Sensors like temperature, smoke, UV, infrared etc. are used to detect intrusions and also help in preventing hazards such as fire. It makes life easy by operating just by hearing your command or at the click of a button. Imagine coming home from a tiring day at work and finding yourself being able to kick back and relax while your home automation system switches on the lights, AC, TV, etc., for you. Even though it is a slightly expensive venture, people are being drawn into it like quagmire because of its simplicity and effectiveness. Big players in the market such as Schneider Electric have taken up home automation and promise a dream-like experience. Most of these systems have a mobile application in place which enables you to control your home from anywhere, at the click of a button. Smart agriculture: Agriculture has always been associated with cumbersome, toiling labour. Smart agriculture aims to address just that. Especially in India, where a majority of our population still heavily depends on agriculture as their main source of income, automation in this sector would be welcome and help bring about a structure in the erratic farming methods practised in India. Sensors such as humidity, temperature, etc. are employed so that the status of the crops can be tracked real-time and alerts can be sent to the farmers via SMS. Even though these projects are still under development, they may soon see widespread implementation. Smart cities: Smart cities represent an amalgamation of all the real world applications of IoT in today’s world. This may include smart parking, smart retail, smart lighting, home automation, the list goes on. Indian Prime Minister Narendra Modi has taken up the initiative of creating 100 smart cities in India. These aim to be citizen friendly and sustainable. Apart from these applications, almost every existing software in today’s world uses IoT in some capacity. Compliance tools like VComply use the cloud which is an integral part of an IoT network, to store its data. This helps in creating a centralized repository for all your documents, making them easily accessible across various devices and platforms. IoT has indeed made its presence felt in every field and is further expected to enable us to create a stronger and better future, employing technology to make life as we know it, way easier. Doesn’t the hubbub surrounding IoT feel absolutely justified now? To learn more about how VComply integrates the cloud into its application, click here.